A half hour drive from Salerno through Avellino 4km east, we arrive at Atripalda, in Provincia di Avellino, in the Campania region where the famous Mastroberardino winery is located. I met with Export Director Lucrezia Bencivenga, who tasted wine with me, and provided a lovely cellar tour. Mastroberardino is one of the largest wineries in all of Italy in terms of production, yet despite its size, the wines are firmly mired in the old world style that speaks of the land and soil. With a history dating back to the early eighteen century, the winery are pioneers and flag bearers for all of Campania and wines from this region. The present-day winery was founded in Avellino in 1878 by Angelo Mastroberardino, and since then 11 generations have carried on – interestingly for the first time, the next generation will be two girls who are presently teenagers. 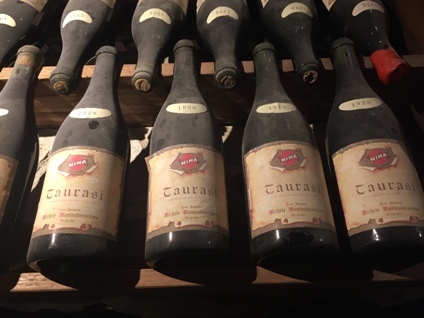 They spearheaded the DOCG classification for the Taurasi area in 1986, but they had the foresight to called their wines Radici to stamp themselves with a brand name which means roots. 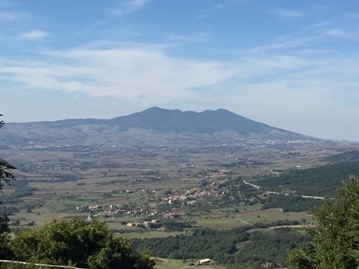 As many wineries called their wines Taurasi, only Mastroberardino calls theirs Radici. While they are known for its production of Taurasi DOCG as well as its dedicated work in identifying and preserving ancient grape varieties like Greco and Fianothey, they are widely credited with bringing favorable critical attention to the wines of Campania, particularly for previously unheralded wines like Lacryma Christi, Greco di Tufo and Fiano di Avellino. We tasted in their fabulous tasting room their famous Vesuvio based Lacryma Christi wines, white and red – the name of this wine is rooted in a legend where God cried when he found a corner of Heaven stolen by Lucifer and where his tears fell, there grew the grapes that make Lacryma Christi, translated loosely as “tears of Christ”. The white is made from 100% Coda di Volpe grapes grown on volcanic soils, this wine is fermented in stainless steel to preserve its unique, fresh profile with a lovely pears and white flowery nose, with peach, licorice and minerality on the palate – try with a seafood risotto. The red is made from 100% Piedirosso grapes (the other red grape in the area) grown in volcanic soil near Mount Vesuvius and fermented in stainless steel. It has an intense ruby-red color, aromas of cherries and red fruit underscore notes of plums, raspberries, and black pepper and a slightly bigger feel of Pinot Noir. Refined tannins and good acidity make this wine rich without being overpowering , this is a unique red wine that is youthful and bright, but substantial. Both of these will be coming into the store in the late fall. We currently carry only one Mastro wine (with several more on order now), it is the excellent Redimore, which is made from clones propagated by pre-phylloxera vines – thoroughly ignimatic. A link to the previous travel blog here.. Many thanks to Crimson Imports for setting me up with this visit! Next up – Feudi di San Gregorio. 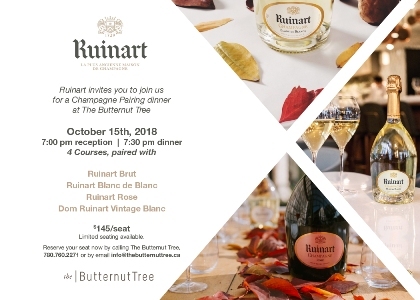 On Monday, October 15, there will be a Champagne Ruinart food and wine pairing dinner at the Butternut Tree Restaurant (9707 110 St NW #101). where Chef Scott Downy will be preparing a four course dinner to pair with four special Champagnes from house Ruinart, a favourite of ours. The cost is $145 per person. 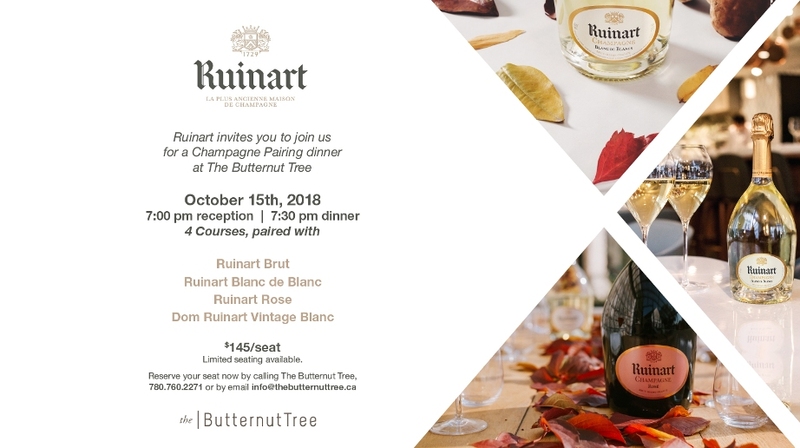 We will be bringing in the showcase Champagne – the 2004 Ruinart Dom Vintage Dated Blanc de Blancs- $254.99 just for this dinner. See the full size postcard for this event here..
First, many thanks for those who came out to the Wein, Schwein & Dine event last sunday, it was a smashing success! deVine Wines is pleased to host another online charity auction for 2018 in support of our Charities of Choice. This year, the partners have elected to support the Edmonton Food Bank and the Neon Sign Museum. We look forward to working closely with our charity partners in 2018. Our last online auction held in 2016 yielded an astounding $19,450 in proceeds that were donated entirely to the Edmonton Food Bank. The 2018 online auction will begin posting on Saturday, September 1 and bidding will end on Saturday, November 10. Everyone will have a great opportunity to bid on a wide range of interesting products and cool experiences over a three month period. As usual, there will be an outstanding selection of wines and spirits, gift certificates, artistic pieces and events to attend. Proceeds of the Online Charity Auction will be split 70/30 between Edmonton’s Food Bank and the Neon Sign Museum. The food bank will be the major beneficiary of the proceeds. Our goal in supporting the Neon Sign Museum is to raise money to recreate one of Edmonton’s lost iconic neon signs, that of the Seven Seas Restaurant. So please start bidding and don’t forget to bring food items next time you visit the store – donation boxes are set up at deVines. New auction items will constantly be added to the auction, so stay informed by visiting the bidding page frequently or by subscribing to our e-newsletter here.. Drove a couple of hours from Salerno to the Grifalco estate in Basilicata where I was greeted by winemaker and owner Lorenzo Piccin. He is only 30 years old and his first vintage was when he was 22 years of old – how novel is that? His parents originally had property in Montepulciano, but in 2003 they sold and purchase Grifalco in Vulture. The name Grifalco pays hommage to the past and present – the Gryphon is the symbol of Montepulciano, and the ‘falco’ part is the hawk, symbol of Monte Vulture, the now extinct volcano. They only make 5 wines and 2500 cases total production (love these small family-ran wineries, they do everything end to end), but there are 80 year old vines available to Lorenzo and he separately ferments and stores the wines in large barrels and only blends them together just before bottling. Vines are replanted only when they die by stealing a branch from existing old vines. 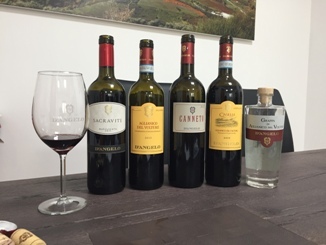 He tasted me only out of barrel – such wonderful organically farmed sites in Damaschito and Daginestra, are vinifed and stored separately – we got to taste the different characteristics that is to go in the final mix of the 2016 and 2017 Grifalco’s, their flagship wine. The former was very floral and the latter the minerality and rusticity while a third barrel came from two other estates in the Vulture area that definitely provided the structure and color – brutes! Lorenzo also passed on that the great wines must come from the middle parts of the vineyards, between 450 and 580 meters in elevation – if higher it will be unripe, if lower than that range, it will be flabby due to the high heat. 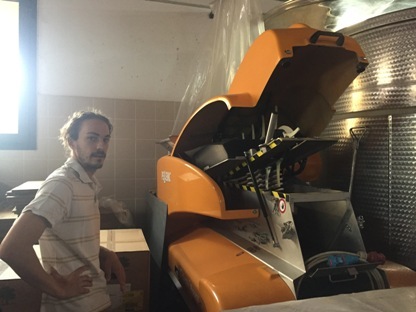 He also stressed that he will never blend international grapes (like Merlot) into his wines, he is true to his roots – the Aglianico grape is the only one he’ll work with. 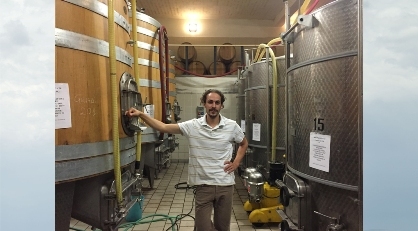 He learnt his craft in the Piedmont, and is trying the extended maceration techniques so prevalent there with his grapes. Other tidbits I got was he loves his very flexible grape sorter (see pic), he loves X-country skiing with his dog. Many thanks to Bonvida Wines for setting me up with this visit! After a week of frolicking around Rome on my own, I took the train from Rome to Salerno is an easy 2.5 hour comfortable ride. Salerno is a commune of the Campania region in southeastern Italy, homebase for the next 8 days as I travel by car to wineries in both Campania and Basilicata and then a quick visit by ferry boat to Ravello via Amalfi town to visit one of our Limoncello producers. Do check back every few days as I will write and post travel blogs as I move along. 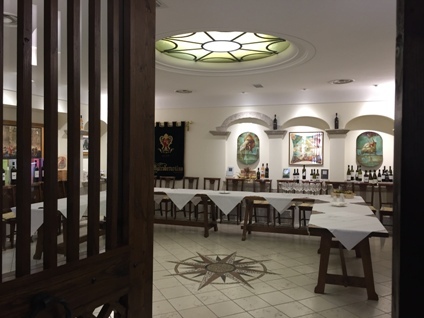 After negotiating free-for-all out of the Salerno, it was a two hour drive to my first winery, the D’Angelo, where I was greeted warmly by Erminia D’Angelo, owner and Export Director. She along with her brother Rocco who is the winemaker are the exciting pair that run the show here. The two of them are in their early thirties, so you don’t see that very often in the wine world. Nevertheless, the family has been the face of the Aglianico grape (one of the oldest known) in the Basilicata region for a century. With 35 hectares to work with, and nicely located at the foot of the now inactive Monte Vulture volcano, the soil and land imparts its character to the wines. Erminia took me down to the old Southeast facing plots of old vine Aglianico that will be picked in mid-late October – it is one of the latest grapes picked in Italy. There is younger Merlot as well. The total production is 300k cases of wine. 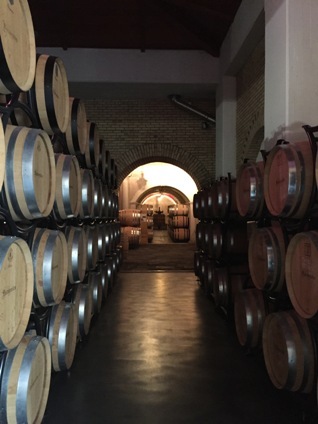 Onward to the tasting room, where I enjoyed the 2016 Sacravite, a absolutely gorgeous Aglianico del Vulture 2015, and then the Canneto and Caselle – two higher end versions that show both great fruit and long aging potential. A special treat came in an Amarone like ‘experiment’ the Vendemmia Tardiva came directly from barrel – lighter than typical Amarone, but that exquisite graphite, chalky, mineral character and only a slight hint of sweetness. The whole lineup was stellar and we’ll try to bring them in for you. It was while tasting that I mentioned I had a 3 o’clock meeting with Quinta del Portale that this estate was also owned by these two and the the Portale wines are made at the D’Angelo facilities – dah – how is it that two wineries have two entirely different agents representing them in Alberta – go figure. Thus we proceeded to taste the Portale line – the winery is named after a now defunct Portal Wall that used to sit in amongst the vines. This line is definitely more new worldish – great ripe fruit and pop-and-pour wines for earlier/current consumption while the D’Angelo wines will gracefully age a decade or more (Erminia said they opened a 1987 that was still showing well this year!). She spent over five hours with me (how many owners would do that) and also took me out for a late lunch (15 min drive) to the town of Lagopesole and its historic castle, the Coste Castello, where we took a picture of the Volcano and you can see their property at the foot of it. (see top photo). A thoroughly enjoyable day – Gracie Mille Erminia!! Many thanks to Crimson Imports and Lanigan & Edwards for setting me up with the visits!